On the main floor, the Library has eleven (11) desktop personal computers (PCs) with access to the Internet and equipped with Microsoft Office software (Word, Publisher, Excel). Adults, and students in the ninth grade and up, may use these computers with a valid RCLS library card or guest pass. Children in the sixth through eighth grade must have signed permission from a parent or guardian; children in fifth grade and lower are asked to use the computers in the Children’s Room on the lower level. The Library also owns ten laptop computers for use in computer training classes offered at the Library. Patrons may use their own laptops and connect to the Internet wirelessly. In-floor power outlets are located below most worktables on the main floor. To ensure fairness and equitable access, the Library’s desktop computers are programmed in timed sessions. Each patron is entitled to up to two (2) hours of computer access per day, subject to availability. Additional time past the initial half hour is automatically offered in 15-minute increments, providing there is no reservation on that computer. Extensions beyond two hours are possible depending on availability, and are handled case-by-case at the Help Desk. Patrons may reserve a desktop PC up to a day in advance by calling the Help Desk at 986-1047, ext. 3. The patron’s valid library barcode is needed to hold the reservation, and the card must have less than $3.00 in fines on it. A reservation expires ten (10) minutes after the start time, rendering the computer available again for other patrons. Patrons who need to save their work are strongly encouraged to bring a portable flash drive. The public computers do not permit saving documents on the hard drive. Documents saved in the “temp” file are erased automatically overnight. Flash drives are available for sale at the Help Desk. Prints cost $0.15/page for black and white, and $0.25/page for color. The cost is deducted from money that the patron puts on his/her Library account before printing. Patrons may pay for prints with cash or by check. Scanning may be done on the copier in the Copy Center; patrons should supply their own flash drive to save the document. The Library’s public computers all have Internet access. No filtering software is used. Library access to the Internet is governed by the Library's Internet Use Policy. Signed permission by a parent or guardian is required for a child in the 8th grade or younger to use the Internet at the Library. 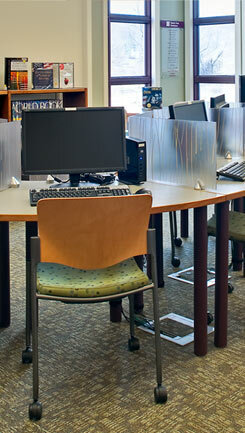 The Library provides free wireless Internet access in the building only, while it is open.